After a nine-day sorta staycation, I’m back to my normal routine, which includes posting stuff on this blog. I hope that I’ll be writing some more substantial pieces in the weeks to come but for now, I have made a list of things I did while I was off. I was too busy taking selfies like this to write while I was on vacation. – Replaced my stolen and kinda broken iPhone 4S with a new iPhone 5S at a precise moment in time when I have like, zero money. But yay! New phone! – Caught up with some high school friends at Luzzo’s in the East Village, which I recommend if you like good pizza, which you probably do. (If you don’t, you’re probably a piece of garbage). 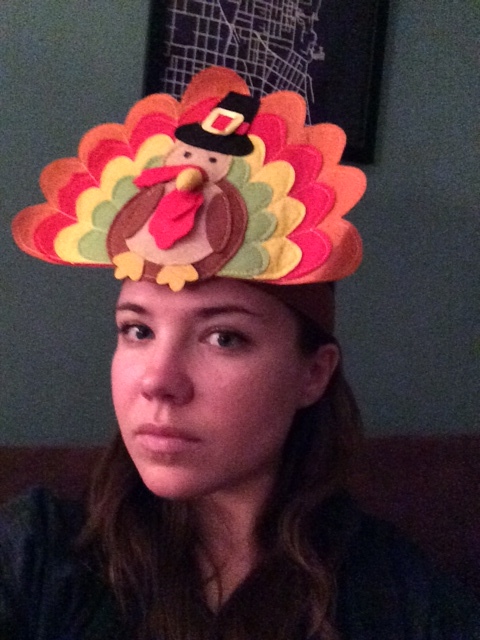 – Hosted a large, raucous potluck with my friends Jen and Liza on the Saturday before Thanksgiving. Our Fourth Annual Cheesegiving was so much fun, filled with the best people and lots of good food (and lots and lots of drink). A big thanks to all of you who were there to party! – Nursed a number of mild-to-vicious hangovers after visiting a number of my favorite bars in Greenpoint and Bed-Stuy. – Spent too much time here, silently willing one of the baristas to fall in love with me. – Immersed myself in the world of Hild, Nicola Griffith’s new novel about St. Hilda of Whitby. It’s really, really good. – Watched all of the TV I’d missed over the last few weeks. – Stayed up until 2:30 am singing the soundtrack to every musical – by which I mean most of Wicked and The Sound of Music – with my roommate on the eve of her 27th birthday. – Missed out on Thanksgiving Eve in my hometown for the first time in probably eight years. Which means I also missed out on the epic Thanksgiving Day hangover I usually have. Instead, I stayed in Brooklyn and watched two German films by myself. Lore and Barbara are both great, though don’t expect to feel uplifted after watching either of them. (Both are available on Netflix). – Made my favorite Pumpkin Swirl Brownies (from Smitten Kitchen) for Thanksgiving dessert. And some Peanut Butter Cookies using this PB Crave Chocolate Peanut Butter. – Spent Thanksgiving Day with my Flannery family in Newburgh. It was great to have all of my immediate family and cousins and aunts and uncles and grandma in one place! – Spent a solid 24 hours in Binghamton with my other grandma (and mom and sister). It was equally great to get to see most of my other cousins and aunts and uncles. – Caught Mauvais Sang at Film Forum. It’s playing through this Thursday, December 5th so if you’re looking to see a crazy but very good/beautiful French film and have some extra time on your hands during the next few days, you should check it out. Um, so now you are caught up on what’s going on in my world, I guess. I’m looking forward to writing lots more this month! More culture reviews, more recipe tests, more Paris, more everything! I’m taking ALL of your book recommendations, Haley!